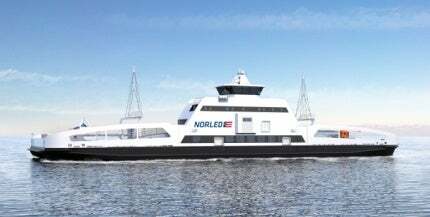 Norled's Ampere ferry was delivered in October 2014. Image courtesy of Fjellstrand AS. Ampere is the world’s first electric powered car ferry. Copyright: Norled. Ampere is built by the Norwegian Shipyard Fjellstrand in Omastrand, in collaboration with Siemens and Norled. Copyright: Norled. Final outfitting of the innovative ferry. Image courtesy of Fjellstrand AS. Ampere (formerly ZeroCat) is a groundbreaking ferry constructed for Norled by the Norwegian Shipyard Fjellstrand in Omastrand in collaboration with Siemens and Norled. It is the world’s first electric-powered car ferry and generates zero emissions and minimum sound. The ferry was delivered in October 2014 and commercial operations began in May 2015. The advanced vessel operates on a 5.7km crossing in the Sognefjord between the villages of Lavik and Oppedal. It makes approximately 34 trips a day, each trip requiring approximately 20 minutes, excluding the 10min of loading and unloading time for cars and passengers. MV Island Performer is a multifunctional offshore vessel built at the Ulstein Verft shipyard in Norway. The project is the result of a competition launched by Norway’s Ministry of Transport and Communications in 2011 to develop an environment-friendly ferry for providing service on the link between the two villages. Norled won the competition, which granted the company the concession rights to operate in the route through to 2025. The new vessel established the viability of operating electric-powered ferries in 50 ferry routes within Norway and beyond. The ferry is designed as a catamaran with two hulls. It is 80m-long and 21m-wide with seven crew cabins and 140 chairs. It accommodates up to 120 cars and 360 passengers. Ampere’s hulls are constructed out of aluminium rather than steel to significantly cut down on the overall weight of the ferry. LED lighting, solar panels and a heating, ventilation and air conditioning (HVAC) system with a waste heat recovery system are featured onboard for low-energy consumption. Electric instant water heaters are also featured onboard. The new environment-friendly vessel annually cuts down the use of one million litres of diesel and offsets 570t of carbon dioxide and 15t of nitrogen oxide emissions compared to conventional ferries plying on the same route. The vessel’s propulsion system integrates Siemens BluDrive PlusC solutions. It has two onboard 450kW electric motors, one of them driving the thrusters. The motors are powered by lithium-ion batteries with an overall output of 1,000kWh and a weight of 10t. "The advanced vessel operates on a 5.7km crossing in the Sognefjord between the villages of Lavik and Oppedal." Rolls-Royce supplied its Azipull thrusters, integrating a full feathering controllable pitch propeller (CPP), which is fitted on the vessel’s hull. The propulsion system enables the vessel to sail at an operating speed of 10k. The lithium-ion batteries are recharged during the 10min loading and unloading time of each trip from the charging stations located at each shore and directly from the local hydroelectric-powered grid at night. A 260kWh battery is also located at each shore to supply power to the vessel while it recharges.